Modern Meadow–a lab-grown meat startup–is getting closer and closer to growing leather in a test tube. But that’s just the beginning. Why grow regular leather when you can use your lab to make leather better? “By the end of the year, I think we’ll be able to produce a two centimeter by two centimeter sample of leather that’s made without killing an animal.” That’s a prediction from Andras Forgacs, the CEO of Modern Meadow, a Peter Thiel-backed startup that came out of Singularity University’s incubator. In the past few years, we’ve seen a handful of projects looking at the viability of lab-grown meat–meat that’s identical to the stuff that comes from cows, chickens, and the like but is grown in a lab. Modern Meadow is taking on the lab-grown meat challenge. But first, it’s creating something that won’t require FDA approval: lab-grown leather. We first wrote about Modern Meadow last month, when Forgacs offered up preliminary details on the tissue-engineered leather project. “The idea struck us that if we can make medical-grade tissues that are good enough for drug companies, good enough for patients, then certainly we can find other applications for tissue engineering,” he told Co.Exist. The leather-making process, described in full at Scientific American, involves gathering cells from biopsies of animals, isolating and modifying the cells, multiplying the cells in a bioreactor, centrifuging the product to create aggregated spheres of cells, layering and fusing the cell aggregates, putting the cells in a bioreactor so they can mature, and eventually harvesting the skin tissue, which will have turned into a hide after a number of weeks. But you don’t need to know how the sausage is made. Just know that out of that complex process comes real leather, sans a dead animal. 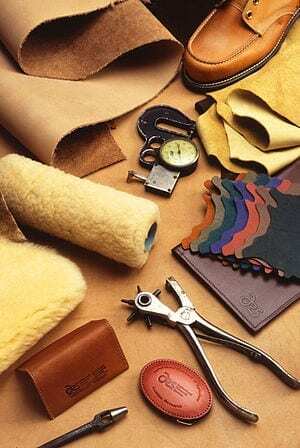 There are advantages to Modern Meadow’s leather, beyond the animal rights aspect of the product. The traditional leather tanning process is toxic and can harm the people involved, not just the animals. Also, 20% of leather used in the industry is wasted because it isn’t the right shape or size. Modern Meadow’s process skips the toxic part of the tanning process (splitting leather and removing hair) and doesn’t waste what it produces. The company is interested in creating lab-grown leather that’s identical to the “real” thing, but also in improving upon what already exists. “At this point, the goal is to create products that are both biomimetic–very, very similar to real leather–and also to look at ways that we can improve upon it and make products that are superior to traditional leather,” explains Forgacs. Modern Meadow could make leather with better durability, breathability, and elasticity, for example, depending on what consumers want.